From the streets of Arkham to Middle-earth to Rokugan and beyond, the games we play often inhabit vibrant worlds that provide the perfect backdrop for telling our own stories. But how do stories emerge from the simple act of playing a game? 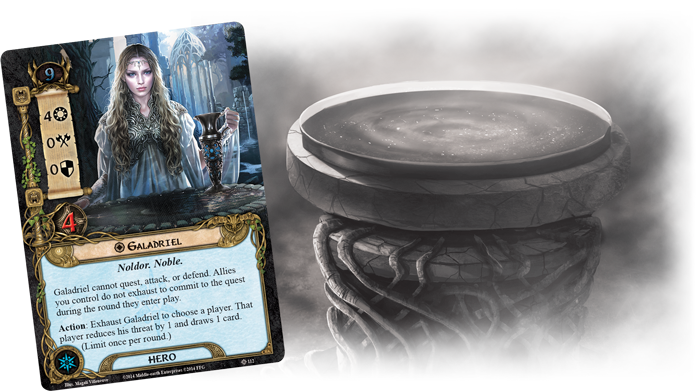 Today, Matt Newman discusses some of the ways in which cards and mechanics can coalesce into rich stories—and how these pieces can be the springboard for our own imaginations. Today I’d like to talk about a topic that is near and dear to me—storytelling. I’m a writer and a roleplayer at heart. I like to forge worlds, create characters, and then weave a narrative wherein those characters are placed in that world and tested. So, as you might imagine, my favorite kinds of games are those which tell a story through gameplay. Roleplaying games are an obvious type of game for crafting your own narrative, since they give players near-unmitigated control over the story. But what if you’re playing a card game? In card games, each individual card may tell its own mini-narrative, but how does one combine dozens of cards together to tell a cohesive story? In this journal, I'll offer some tips and tricks for players who, like me, wish to use cards to better immerse themselves in the game. It’s important to note that this concept isn't just limited to cooperative card games with a built-in narrative, like Arkham Horror: The Card Game or The Lord of the Rings: The Card Game. These tips can help you get into a storytelling mindset when playing any of our card games, from Star Wars™: Destiny to Legend of the Five Rings: The Card Game. 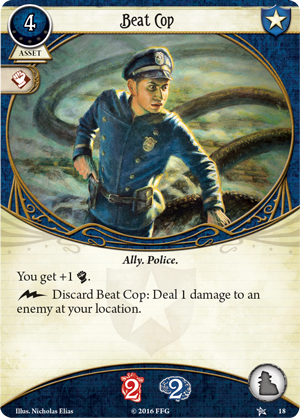 One of the most difficult things for some players to overcome when using cards to tell a story is when a game system employs an abstract game mechanism like “resources,” “rounds,” or “actions.” These are, in essence, game terms with little narrative consideration… or so it would seem. 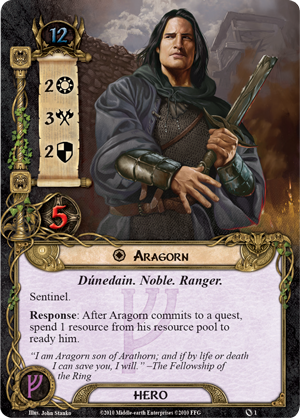 For example, both The Lord of the Rings: The Card Game and Arkham Horror: The Card Game employ the use of generic resources as a means of controlling how many cards you can play in any given turn. But what is a resource? Is it money? And what does “playing a card” represent, anyway? On its face, it might seem that these are questions that card games are not prepared to answer. The truth is that we want you to answer those questions. 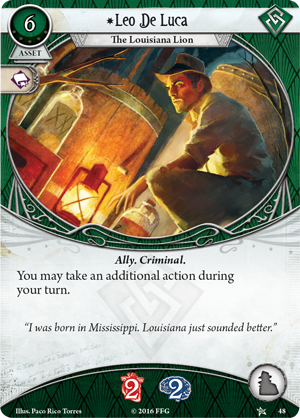 In Arkham Horror: The Card Game, resources can represent many different things. This is purposeful: in different situations, different types of resources could be more appropriate, depending on who you are, where you are, and what you are trying to accomplish. 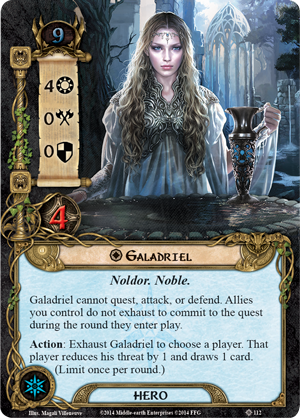 By keeping resources somewhat abstract, players can weave their own narrative each time they play a card. Did you just go to the store and purchase a .45 Automatic (Core Set, 16) with money? 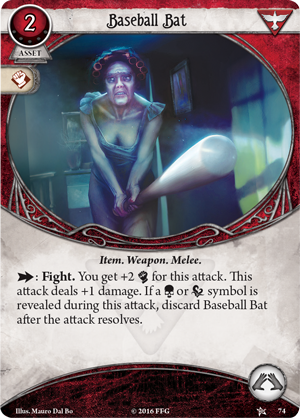 Perhaps if you are playing a scenario like The Midnight Masks, which takes place all around the city of Arkham over the course of a whole night, this would make sense. But perhaps you simply scavenged around your location and found a .45 Automatic laying around. This might make sense if you are in a smaller, unfamiliar environment, like an abandoned house. Or maybe your resources represent your investigator mustering up the bravery to finally unholster the .45 Automatic they had brought with them all along. The truth is that any of these explanations might make sense depending on your situation. Did you find Dr. Milan Christopher hanging around Miskatonic University on his own and convince him to join you? Or did you bring him along with you from the start, and his contributions to your investigation have only just started at the time he entered play? You should feel free to use your own creativity in deciding how a card entered play from a narrative perspective. I’ll never forget the time that Nate French decided that he hadn’t found a Baseball Bat (Core Set, 74) in the attic; he had taken a two-by-four and whittled it down to roughly the shape of a baseball bat. Is that a practical explanation? Maybe not, but it’s certainly memorable. The same can be said for any abstract game concept, such as actions, rounds, fate in Legend of the Five Rings, etc. 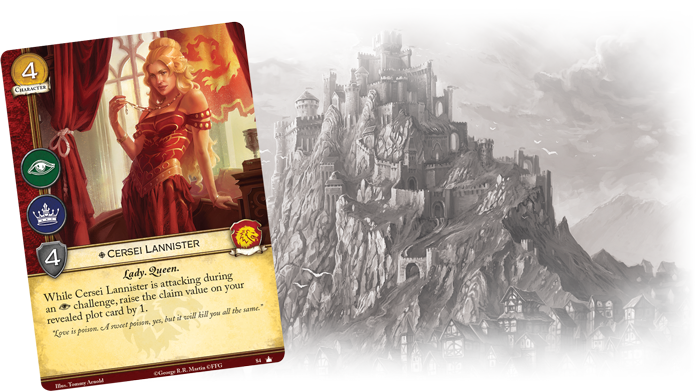 Even more specific aspects of gameplay like an “intrigue challenge” in A Game of Thrones: The Card Game can be explained in multiple different ways. 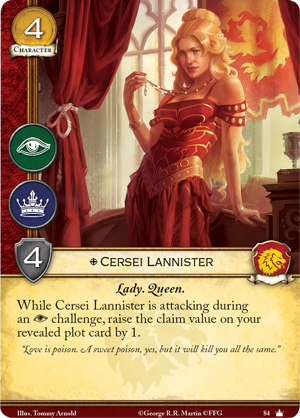 Did Cersei Lannister (Core Set, 84) just eavesdrop on a conversation? Or was it blackmail? Maybe even a well-timed assassination of a behind-the-scenes character who is not currently in play? We leave these questions open to interpretation so that you, the player, can interpret them in whichever way you think makes the best story. Another concept that players sometimes struggle with is the reconciliation of a card “leaving play” and its role in the story not being over. 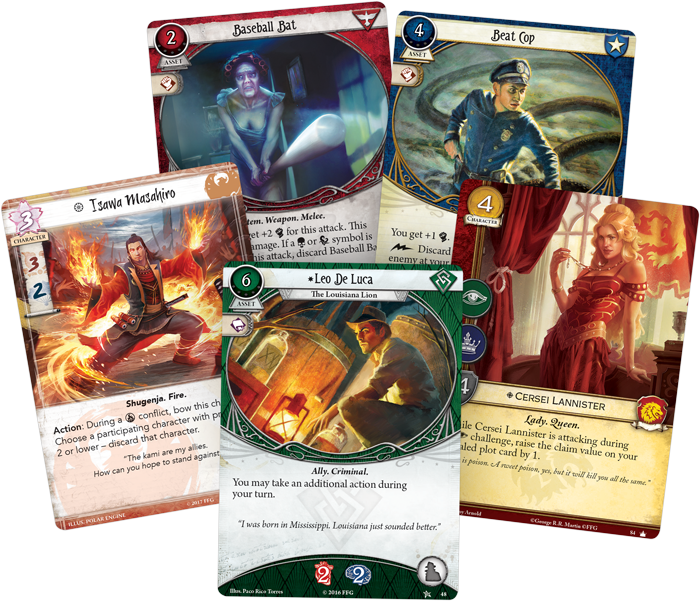 This is something A Game of Thrones: The Card Game specifically draws attention to with its use of a separate “discard pile” and “dead pile.” Characters who have simply been discarded are not dead (yet), they are simply out of the spotlight for the time being. 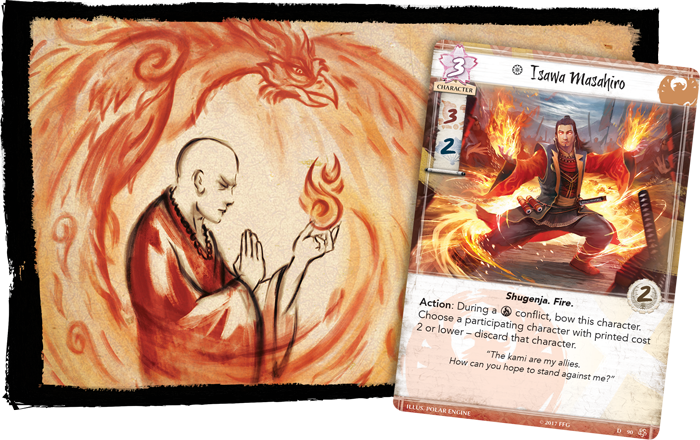 Legend of the Five Rings: The Card Game has a similar explanation with its unique “fate” system. When a character runs out of fate, it doesn't mean that they have died (although this is certainly one possible interpretation); it merely means that their role in the story being told has passed. 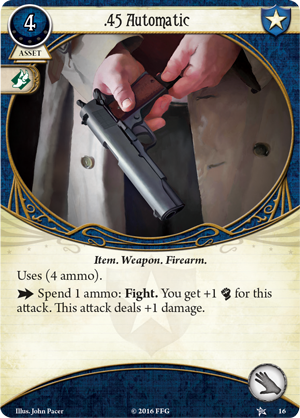 In games like Arkham Horror: The Card Game and The Lord of the Rings: The Card Game, a character is destroyed when their health or hit points are reduced to zero, but that doesn't mean they are permanently dead. Indeed, simply by shuffling your discard pile back into your deck, we might see those same characters appear once more. Why is that? Again, players should feel free to use their own creativity and storytelling skills to answer this question. Perhaps Leo De Luca (Core Set, 48) wasn’t killed, but just temporarily retreated out of harm’s way. Or maybe we thought he was dead, only for him to reappear at a crucial moment and save the day. 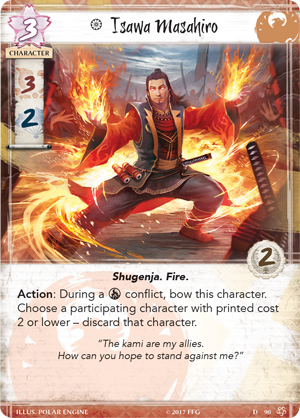 It may seem at first glance like Isawa Masahiro (Legend of the Five Rings: The Card Game Core Set, #90) just burned somebody alive in the middle of a political debate, but it’s just as possible that he used his magical prowess to intimidate them into fleeing the scene. …But Thranduil Doesn’t Like Dwarves! 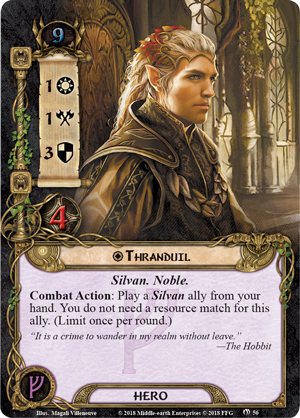 Often times when you see a player building a “thematic” deck, they do so by including cards that only make sense alongside the other cards in the deck, from a narrative perspective. And often, as designers, we try to make such combos appealing, to appeal to those players who enjoy the source material. 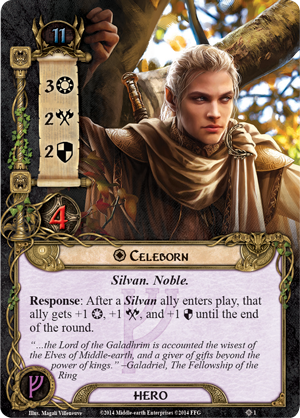 For example, if you’re building a Silvan deck in The Lord of the Rings: The Card Game, you’ll find Galadriel (Celebrimbor’s Secret, 112), Celeborn (The Dunland Trap, 1), and Thranduil (Fire in the Night, 56) to be extremely appealing hero options. This is done on purpose, to better serve the narrative. 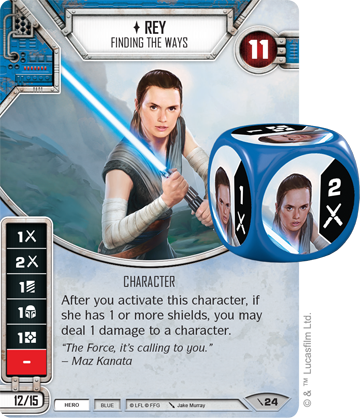 Another example is the combination of Luke Skywalker (Way of the Force, 56) and Rey (Two-Player Game, 24) in Star Wars: Destiny. 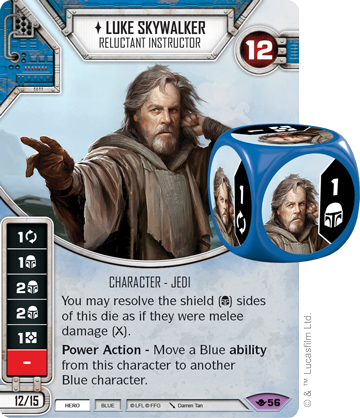 In addition to adding up to exactly 30 points, Luke can use his ability to pass Blue ability upgrades from himself to Rey, which feels true to the source material. But players shouldn't feel compelled to stick to such archetypes. 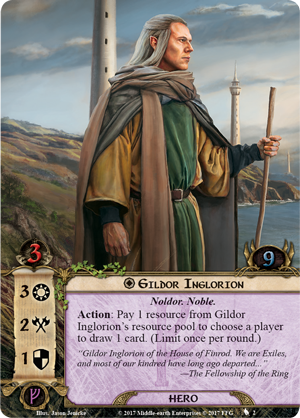 Just because Aragorn (Core Set, 1) and Gildor Inglorion (Limited Collector's Edition, 2) never met one another in the text of The Lord of the Rings doesn't mean you can't easily come up with a situation in which they might have. 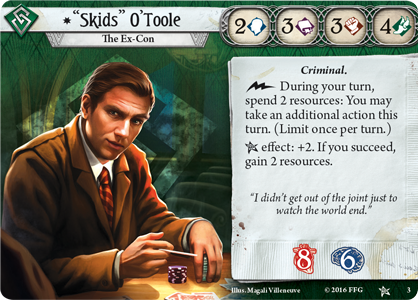 Why does “Skids” O’Toole (Core Set, #3) have access to a Beat Cop (Core Set, 18) and Police Badge (Core Set, 27)? Well, who said that Beat Cop was strictly on the ex-con’s side, and who said he obtained that badge legally? In other words, don’t be afraid to weave your own tales when deciding how two cards might appear in the same deck, even if they might not seem like a natural complement to one another. In fact, sometimes the seemingly unnatural combinations lead to the most inspired and interesting stories! 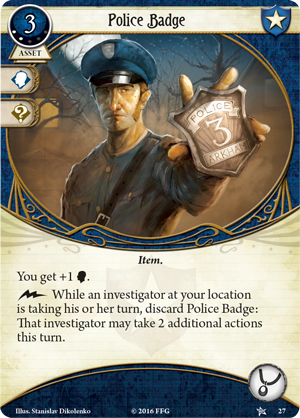 Instead of letting the artwork and mechanics of a card dictate the story, players can use cards as props to help them tell their own story. Some cards may fit naturally into the narrative you are weaving, but if they don’t, use them as a storytelling opportunity from which your imagination can soar.